The Silver Yards wet beneficiation plant operates on a seasonal, weather-dependent basis and is designed to produce lump, sinter and ultra fines products. Phase 1 was commissioned in June 2011 and included primary and secondary crushers, screens, scrubbers and conveyors. In the fall of 2011, the Phase 2 expansion of the plant was completed, which was designed specifically for the recovery of fines material. The Phase 3 expansion for the wet plant was commissioned in June 2013 and is designed to increase the wet plant's production capacity and recover ultra-fine material. During the 2012 operating season, LIM installed a dry classifying system to process (crush and screen) lump and sinter fines products. This additional equipment will supplement the mining sequence and is expected to enhance product yield in future operating seasons, especially during the commissioning period of the wet processing plant. The ROM ore from the pits is fed to the Primary Mobile Crushing Plant. The discharge from the primary crushing is conveyed to the tumbling scrubber circuit. The purpose of this step is to beneficiate the ore by incorporating water to wash the clay materials from the ore materials. The discharge from the tumbling scrubber circuit proceeds to the primary screening circuit. This is the first stage of classification. The oversize material (+25 mm) on the top deck is sent to the secondary crushing circuit and re-circulated back to the primary screening circuit. The undersize material (-1 mm) from the bottom deck is sent to the secondary screening circuit and the remaining material (+1 mm, -25 mm) is conveyed to the Lump Ore screening area. During the secondary screening stage, the oversize material +600 microns from the secondary screen is conveyed to the sinter fines stockpile. The undersize from the secondary screen is pumped to the fines recovery area. The lump ore screen deck has an opening of 8 mm and the oversize material (+8mm, -25mm) is stockpiled via stacking conveyor as a final lump product. The screen undersize (+1mm, -8mm), along with the oversize of the secondary screens, is transported via a stacking conveyor to a stockpile as a final coarse sinter feed product. The undersize material (+150 microns, -600 microns) from the secondary screen is pumped to de-sliming cyclones with the cyclone underflow feeding a density separator. The underflow (-150 microns) from the density separator is filtered and then stockpiled as a sinter fines product. The overflow is currently pumped to the final rejects, but as part of Phase 3 expansion in 2012, it will be further processed in a magnetic separation circuit to extract the (-150 microns) size material as a final ultra fines product. The existing flooded Ruth Pit, located north of the Silver Yards Plant is used as a final plant rejects disposal. The rejects are pumped via 2.9 km long pipe and discharged to the pit. An on-site mobile laboratory in a portable modular building is established at the Silver Yards area. The laboratory includes a sample preparation section with a drier, crushers, screens, pulverisers and rifle splitters and an analytical lab section for daily ore control and exploration samples analysis. The analytical methods used are fusion followed by XRF spectrometry. The material from the Sinter Fines stockpiles and the Lump Ore stockpile is reclaimed with front end loaders and delivered to rail cars. LIM is focused on a strategic and robust growth plan, as the Company intends to develop and mine each of its 20 DSO deposits in five neighboring zones, sequentially in line with their intended stage of production (Stages 1 to 5). 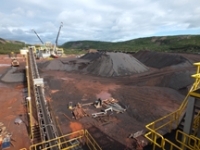 During the mining and development of LIM's Stage 1 and 2 deposits, planning will be undertaken for the future operation of the remaining 15 deposits in subsequent stages (3 to 5), which will include evaluating options for additional processing plants to treat ore in the North-central, South and North zones.